How to Downsize Your Handbag. After spending money on a beautiful bag, it’s worth it to keep it organized correctly. If your purse is so heavy that it’s giving you back pain, discover how to downside your handbag, in order to retain the essentials, but to lose the junk that’s weighing it down. Whether or not you decide to try a smaller purse, here’s how to make sure you’re not giving up anything important, while gaining a more neat handbag, in which you can find your belongings faster. Most women admit to carrying more than they need in their bags and some even end up damaging or completely ruining a purse by shoving too many items in inside. If you’re interested in how to downsize your handbag, start by being honest with yourself about what you really need in your purse, as opposed to what you think might come handy in a hypothetical situation. Fumbling around for your smartphone when it starts ringing is one can be unpleasant or even turn into an embarrassment if you’re in a public place where you’re not supposed to have the ringer on. Keep your smartphone in a separate space from everything else in your bag for easy access. Even if it seems counterintuitive for any plan to downsize your handbag, adding a little something to your keys does help. Instead of keeping them among your other things, ready to get lost or tangled, invest in a key wallet that keeps them separate and can also serve as a matching accessory to your bag. When emptying their big handbags, most women discover they have at least a few doubles that are weighing them down pointlessly. Lip balms and chewing gum are some of the worst offenders when it comes to doubling, but towelettes are also carried around in larger quantities than you actually need. 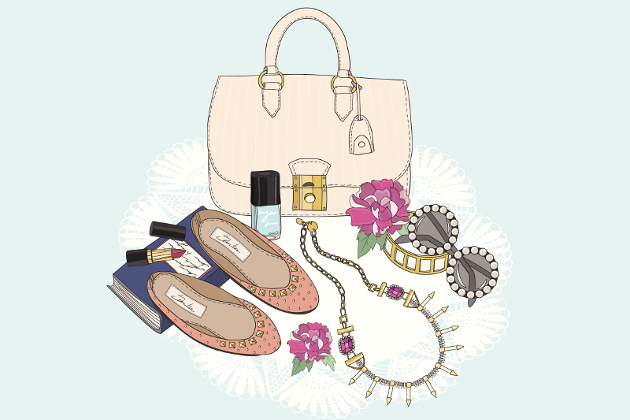 One of the simplest steps on how to downsize your handbag is to lose the doubles. Keeping everything organized takes less space and easy way to do it is by getting different sized pouches that go in your bag. You can choose clear ones to cut down on the time it takes you to find your items or you can opt for brightly colored ones that make it clear what type of items are stored inside. You should go over everything that’s makeup related in your bag on a regular basis. Knowing exactly what you have in there and storing it in a clear pouch will stop you from adding more when you feel you might need a touch up later during the day. Keep your makeup separate from everything else also keeps it safer from bacteria. One of the simplest ways to lose a lot of weight when you’re thinking about how to downsize your handbag is to consider when you use everything. If you tend to use makeup for touch ups at work, there’s no point in carrying them around all the time. Simply get a makeup pouch you can keep at your workplace. Whether they’re power chords for your gadgets or headphones, always take a few extra seconds to secure them or at least place them separate from every other item in your bag. You’ll waste a lot less time untangling them from other things you carry around every day. Most bags come with a darker lining, but if you choose a lighter lining you can always find everything faster. Consider that if you want to downsize your handbag and purchase a new purse that will fit all your essential items, but will also allow you to find them more quickly. When you clean out your bag regularly, don’t forget to check the expiration date for all your makeup, including lip balms and other small items. You might be carrying around products that have gone bad, but you’re still using them without paying attention to their shelf life. You might not think that stress has anything to do with how to downsize your bag, but it really does. Hauling around a lot of useless items shows that you want to be prepared for any situation. Let go of the extras in your bag and let go of the stress. You can’t be prepared for the unexpected and once you accept that, you’ll feel lighter, and you handbag will too!